Maki’s crème fraîche nama caramel recipe is the one I’ve been using for several years now. It is good. But hey, why use one word when you can use several overstuffed sentences? This caramel certainly isn’t the inoffensive and vaguely vanillary sugar-goo hiding inside chocolate bars; this is a confection with depth and flavour. As a basic recipe for caramel it is nigh unimpeachable: the inviting, rich fragrance of burnt sugar comes through very well and the whole thing is made especially luxurious with butter and crème fraîche, the latter adding a subtle lactic tang. As a Brit, I was especially pleased by the use of golden syrup–it also adds a rich sugary depth, if that makes any sense. Lastly, in case there’s anyone reading this recipe who is new to cooking either in general or with sugar syrups specifically: the caramel gets unimaginably hot. You can’t dip a finger in or lick the spoon during or immediately after cooking it. Take care to not skip heating up the cream and to keep cold liquids away from the hot caramel, and to have everything to hand as you won’t have time to fiddle once you get going. Makes 1 x 23 cm (9 inch) square slab round about 1 cm thick. Keeps for several weeks at room temperature/in the fridge, well wrapped. Line the tin with a piece of greaseproof paper, leaving some overhang so you can easily lift up the finished caramels. 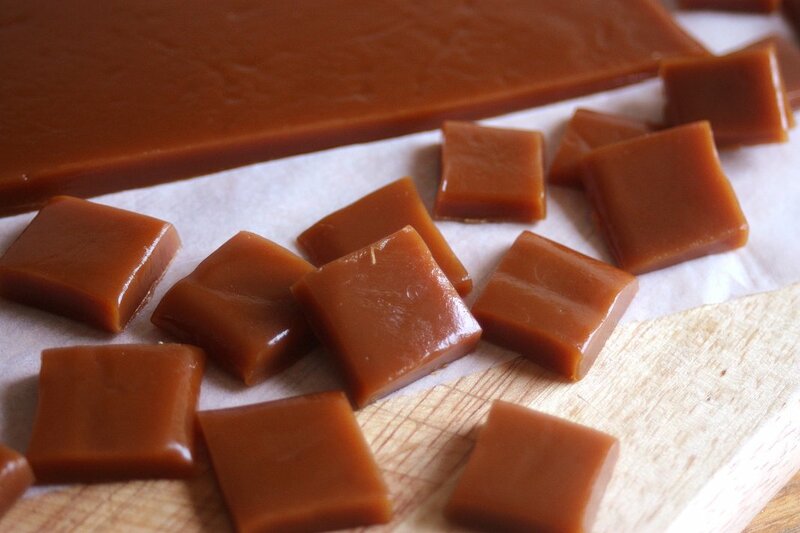 You don’t need to grease anything; the caramel will release itself very easily. Fill a fairly deep heavy bowl, jug, or glass with cold water. Keep within easy reach of the stove. You may have to change the water if it gets too warm. 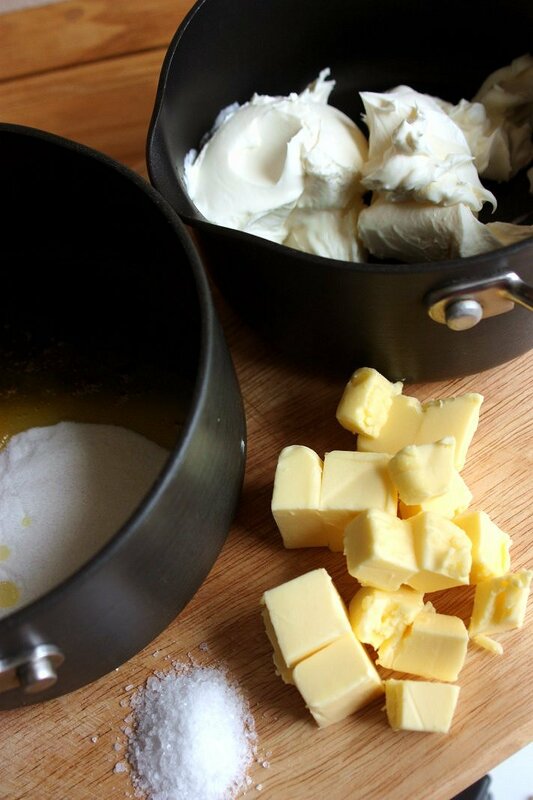 Put the butter cubes and salt into a small dish or plate. Again, keep within easy reach of the stove. Put the crème fraîche into a small saucepan and gently melt it over a low heat until it’s just warm to the touch. Set aside. 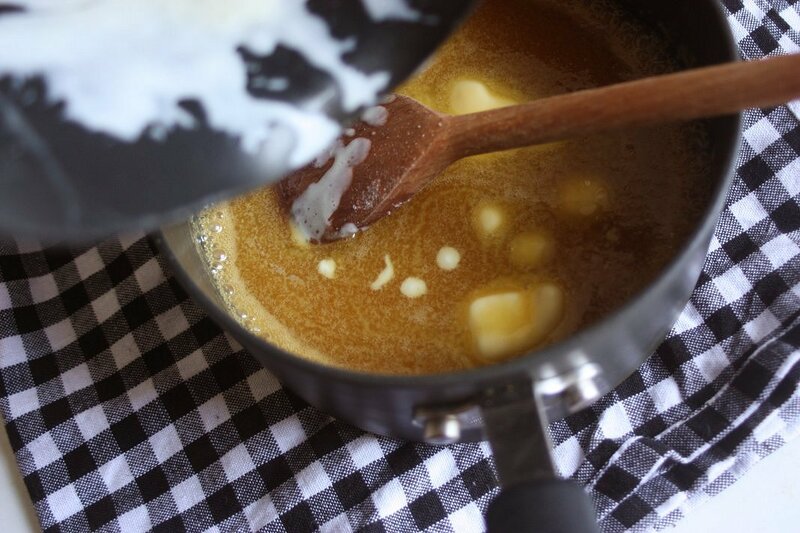 Place the caster sugar and the golden syrup together into another small saucepan and set on a medium heat. Stir until the sugar has completely dissolved, then lower the heat until it barely bubbles. Cook, stirring constantly and watching the syrup carefully as it thickens and darkens. From time to time carefully drop little bits of the boiled syrup into the cold water and test its consistency with your fingers. Once the syrup balls are completely hard, it’s ready. You can cook it a little further for smokier caramels but don’t go beyond a deep brown. Take the pan off the heat and carefully add the crème fraîche, butter, and salt, being mindful of any splatters. Stir until everything has completed melted and all is combined. Put the pan back on a very low heat: you just want the mixture to be gently bubbling away. Simmer it like this, stirring all the time, until it’s reduced to the consistency you want, anywhere between 15 – 30 minutes. Again, periodically test droplets of the syrup in the cold water. The bare minimum level of firmness is a soft and quite pliable ball. You can cook it for a few minutes longer until the ball is chewy and springy if you prefer firmer tablets. Once the caramel’s thick enough, immediately take off the heat and pour in the vanilla extract, stir well, and pour into the lined tin. Leave to set completely. If the surface of the caramel seems a little greasy, gently mop up with a paper towel. Keep the caramel well wrapped and airtight. Cut into pieces as you like. You may have to oil your knife if the caramel is very soft, and store the caramel in the fridge if the room is very hot.